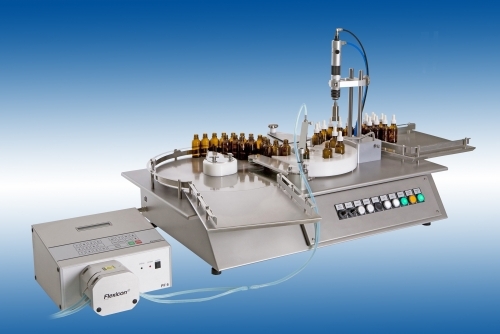 The FF30 meets the demands of very flexible small batch filling of liquids or oils in bottles with screw caps (with pipette or spray heads). At the same time, it provides a consistent production quality that is unobtainable by manually assembling bottles and caps. Furthermore, it protects operators from repetitive strain injury (RSI). The speed of the new FF30 can be easily adjusted to match the working speed of the operator, and liquids can be filled automatically in volumes from 0.1ml to approximately 100ml. Designed for intensive use, a key element in developing the FF30 was to minimise the time needed for product changeover and, at the same time, ensure clean produc­tion without risk of cross-contamination. The upshot is that a consistent cap torque prevents any leakage of liquid, while a bottle/cap change on the easy-to-clean FF30 takes a maximum of just five minutes, helping enhance uptime and productivity. The machine’s small footprint makes it ideal for use in laminar air flow units or bio-safety cabinets. Offering a capacity of up to 1200 bottles per hour (depending on filling volume and operator), key application areas include the diagnostic industry, hospital pharmacies, R&D departments, essential oil manufacturers, cosmetics producers and general subcontract filling/finish companies. A user panel featuring intuitive software is supplied as standard on this IP52-rated, stainless-steel structured machine. Optional fillers include the PF6 or 520Di peristaltic fillers. A customised version of the machine is available for crimp capping of aluminium caps.